They prefer a sandy, loamy soil or a loess soil. Use fast-growing rocket to mark the planting locations. Common white onions are particularly susceptible to fungi in the soil. Your need: One person consumes an average of 21 kg a year. There are very many varieties of onion. There are red, yellow and white onions. There are many subspecies of onion, such as Spanish onions, spring onions, shallots and red onions. One speciality is the pearl onion which is very small and has no protective skin. It needs a sunny, warm location which is not protected from the wind with sandy, loamy soil or a loess soil. Onions are mostly grown by sowing seed or using onion sets. Put onion sets into the soil so that their tip can still be seen and loosely cover with soil. Seed tape is a good alternative to onion sets. Earth up the soil around onion varieties which are sensitive to frost or cover with spruce brushwood. While the plants are still developing, water regularly but not excessively. Regularly loosen the soil to prevent the formation of weeds, as onions do not compete very well with weeds. When sowing, use a quickly growing plant e.g. rocket as a marker. 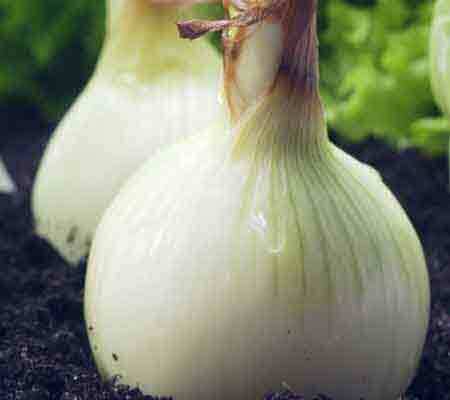 At first, grow onion sets in a protective container and as soon as there is any growth above the soil, plant out. On affected areas, do not grow any members of the onion family for 8 to 10 years. Remove affected, dying plants together with the surrounding earth and dispose via the domestic waste system. The common white onion is particularly susceptible to soil fungi. Onions sown from seed ripen about a month earlier, sometimes even 6 weeks. Onions are ripe when their foliage is no longer erect but lies flat and is dried out to a large extent. Allow the onions to dry out in the open after harvesting for about 10 days. Do not kick the onion foliage over before the harvest, nor rip it off to prevent damage and to prevent the onion from producing new shoots. Do not harvest too earlier as its ability to be stored will suffer and not too late as that can lead to new shoots. Hang onions up directly after the harvest for 2 to 3 days to dry. The time that onions can be stored depends upon the variety. The proven "gelbe Zittauer" keeps particularly well for instance. Summer onions will keep for up to six months. Winter onions will only keep for a short while. They should be kept in place which is dry, cool, dark and airy. Do not keep cut onions in the fridge as their odour transfers to other foods. Do not keep onions together with fruit or it will will negatively effect how long they will keep. Onions are eaten raw, fried or steamed. Externally, onion juice or syrup is used for wounds or boils. Red onions have more antioxidants than yellow or white varieties. The positive effect of raw onions is better than that of cooked or otherwise heated onions. Onions have very high levels of potassium and calcium. The first, outer few layers contain a lot of essential vital elements, so don't peel them too much. One person consumes an average of 21 kg a year. Der Pro Kopf Zwiebeln Verbrauch liegt etwa bei 21 Kilo jährlich. Quellen: BLE; BMELV; DESTATIS; LfL Stand: 14.03.2013.